I continue my journey through the short films of Animation Express by looking at a very unique motion picture that pays tribute to that most “Canadian” of sports: hockey. Ha’Aki, a 2008 movie by writer / director Iriz Pääbo, utilizes a technique its maker calls “animbits” (a process by which the sound and images are created simultaneously) to tell the story of a hockey game. At first, the scenes are familiar: players moving about the ice, passing the puck and shooting it towards the net as the crowd cheers. 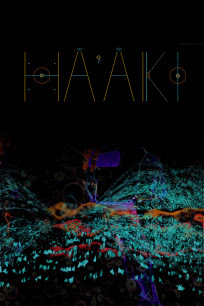 It isn’t long, though, before Ha’Aki adopts a more impressionistic view of its subject, relying on bubbles, flashing lights, and geometric “pieces” to signify the game is still in progress. Apparently not the biggest fan of hockey herself, Pääbo used Eric Nesterenko, a former player with the Toronto Maple Leafs and Chicago Blackhawks, as her inspiration, and from the looks of it, she couldn’t have picked a better one. I’ve been to more than my share of games over the years (In the ‘80s, my father had season tickets for the Philadelphia Flyers), and Ha’Aki does manage to capture the excitement, as well as the adrenaline rush, of watching live hockey. But Ha’Aki is also highly artistic, using the backdrop of a game to present imagery that is, at times, quite stunning (at the halfway point of the movie, we see what appear to be players continuing the game, yet surrounded on all sides by bright lights, which flash and recede in unison with what’s happening on the ice). Those who love hockey will undoubtedly enjoy Ha’Aki, but thanks to the filmmakers unique approach to the material, even those who have never experienced a single game will find something to their liking in this short.